The event will be held on Sunday 14th October 2018, 9am-6pm at Pool in the Park, Kingfield Rd, Woking.We are looking for teams of up to 6 swimmers to swim a total of 55 minutes between them in their own lane, with each member getting sponsorship for the team! So if you can swim and you are at least 8 years of age come along and have some fun and raise money for charity while you do. Woking Rotary Club held their Annual Kids Day providing a special morning of entertainment for children with special needs. 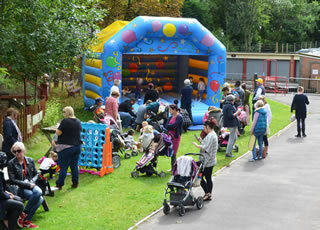 During their visit to the Woking Miniature Railway at Knaphill the youngsters enjoyed over 400 trips on the tiny steam and diesel locomotives as well as a bouncing Castle, face-painting and balloon modelling sessions. Woking Rotary Club would like to thank all the helpers and members of Mizens Railway for their time and support which this event relies upon. 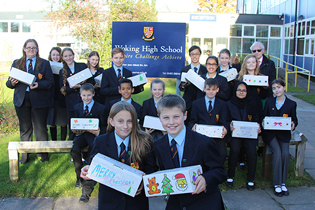 Woking High School contacted the club to say that they were interested in taking part in the Rotary Shoebox Scheme. 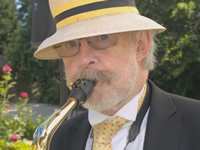 The International Garden Party is an annual event held each July in the garden of one of our club members. The aim is to raise money for overseas charities by way of ticket sales, a Tombola, and a raffle.